In a blog that I wrote earlier this year, I talked about the importance of being prepared for expected changes in the cancer registry. Well, we are well past the half way point of 2018 and are still navigating the changes. In fact, after attending the Florida Cancer Registry Association Meeting, I learned of some changes Cancer Registrars should be aware of. So, I thought it might be high time to provide an update! The STORE Manual (Standards for Oncology Registry Entry) was released on August 15, 2018 and is now available and ready to use. You can access the STORE Manual by clicking here. 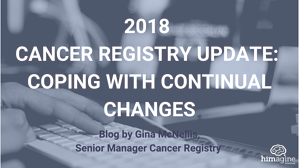 Some cancer registry software vendors might not have their 2018 versions released until October. The Solid Tumor Manual still has some chapters in draft format.